The minimum deposit is MYR 30. Bonuses are subject to 3 times the Total Requirements for Rollover Bets before withdrawals can be made. 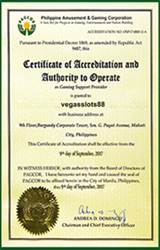 VEGASSLOTS88 reserves the right to change any aspect or terminate this promotion at any time and with these General Terms & Conditions.